I seriously cannot stand the phrase “The Year of the VDI”, and I’m pretty sure most of you reading this might be here because you feel the same way. In the past the notion has been very annoying to me because at each step we’ve solved portions of the infrastructure and application delivery problems, that now is the year for us to relax and push a giant VDI easy button and this will be the year that VDI finally “takes off” like it never has before. VDI is definitely increasing with adoption, with a large part of that due to the fact that more people are actually in the pool (HAH, no pun intended) rather than sitting on the pool chairs wondering if it’s actually a good idea to go swimming. I seem to be having this conversation with customers more and more in regards to use cases. Let’s start with the basics about what a technology use case really is. I usually consider a use case to be how a technology can solve a specific business problem or a specific business enablement or technology optimization. A virtual desktop use case is not a compilation of user data in regards to OS, applications, devices, and desktop resource requirements. A good virtual desktop use case is a set of conditions which end up with a positive, efficient, rapid delivery EUC experience for the end user, and decreased operational overhead for IT. Simply put, VDI doesn’t fit everywhere, it’s the exact reason we should be providing a full palette of desktop delivery options and each has a supporting group of folks. For the purposes of this article, I don’t even take alternative presentation delivery methods into account, such as XenApp or RDSH, which can be combined with any of the options below. For example, a beefy physical PC is a requirement for some engineers that require offline access to large drawings. It’s also a requirement for someone like myself who is a delivery consultant who travels and integrates with many different networks and customer environments. There are other examples of each use case I could give, but you guys get it. The point is the operational and functional requirements for each department, IT organization, security division are different. Knowing which bucket or combination of buckets to put the users in is a paramount skill that the project team must have. Brian Madden has it spot on when he says that executives pretty much care about desktops just as much as they care about desks, lamps, office chairs, office space, cell phones; it’s just a part of the necessary equipment that employees need to get their job done. When a VDI project goes sideways, the operational value-add can often be questioned by the executive layer. 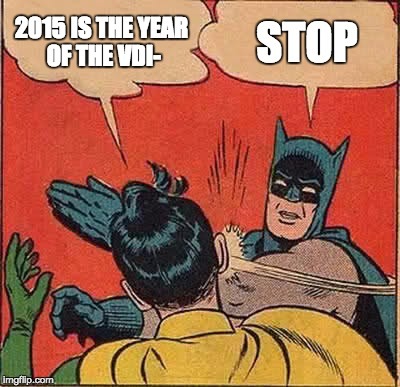 For this reason, I don’t think there will ever be “A Year of the VDI”. Virtual desktop projects take the problems that you know and love on each individual piece of hardware desktop hardware and MOVE them to the datacenter, not remove them. For some use cases, they remove way more problems than they introduce, and for some use cases it’s vice versa. There are some aspects of desktop management that VDI simplifies drastically, there are other things that it complicates and makes more work for the administrative team that didn’t exist otherwise, specifically any involvement of any UEM product. The year of the VDI? How about we take a year to learn how to manage traditional desktops first before we tackle the virtualization of all our desktop applications and operating systems. Here’s a screenshot of Netmarketshare’s desktop OS data, August, 2014 to June, 2015. Anybody notice that Windows XP actually gained market share at the end of last year and since then has only slowly tricked down? For the shops that have it together and can place users in the correct use case buckets, keep it up. For the shops still leveraging outdated desktop operating systems, you need to take a long hard think about why you’re doing what you’re doing from an SDLC perspective. In my opinion, VDI will continue to gain adoption, but will continue to increase at a pace slower than server virtualization did. Capex benefits which were readily realized with server virtualization and consolidation, but VDI is primarily opex savings which is more difficult to measure and less justifiable to executives without an enablement initiative. So what is my recommendation? Stop thinking about how to deliver desktops and focus on the delivery of Windows and applications, then work backwards to a capable solution needed to provide the services to the business, whether the users are leveraging physical desktops, virtual desktops or virtual servers. At that point you should start to see the use cases fall together in a much clearer fashion.